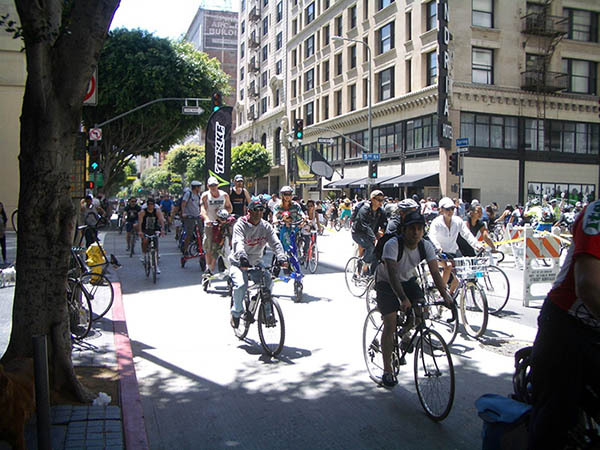 When people move to Los Angeles, many of them are unsure about how bike-friendly the city is. So Oz Moving talked to Jon Riddle, co-author of the book Where to Bike Los Angeles: Best Biking in City and Suburbs, to try and get a handle on managing the City of Angels on two wheels. Jon has been a native of Los Angeles for 20+ years and has resided in Southern California since age 6. In all that time he’s been an avid explorer of L.A.’s bike scene, helped produce several biking events while organizing and volunteering at even more, and advocating for accessible bike paths. He’s also rode bikes in New York City, San Francisco, San Diego, Chicago, and 3 other continents, riding in Vietnam, Singapore, France, Spain and Peru. Riddle has been certified by The League of American Bicyclists as a League Cycling Instructor, so he knows how to inform people about biking in Los Angeles. We talked to him about getting your two wheels with LA. First thing’s first, and safety has to come first riding your bicycle in a city with as many cars as Los Angeles. Riddle’s advice is to take a safety class from the Los Angeles County Bicycle Coalition. 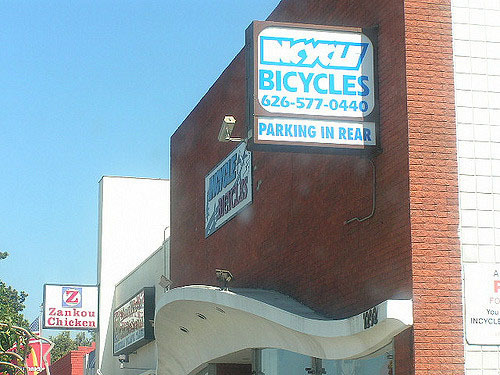 “Their courses are taught by bicyclists with years of experience biking in Los Angeles”, Riddle said. (Learn more about the LACBC bike safety classes here). Beyond that, Riddle has two standard pieces of advice - wear a helmet, and have lights on your bike. “Lots of bike accidents happen at night. More than in the day.” Visibility is key to avoiding bike accidents, a key reason why Riddle recommends riding in groups whenever possible. Marvin Braude Bike Trail- From the Pacific Palisades to the Palos Verdes Peninsula, this bike trail provides a smooth ride. It’s great for new cyclists. The trail goes right along the beach, pacific ocean views, and rides through the nice beach side communities from Manhattan Beach to Santa Monica and beyond. “The Donut” - This Loop around the Palos Verdes in South LA county has an awesome set of hills for more advanced riders.“This is a more challenging ride for experienced cyclists”, Riddle said. The ride is about 20 to 25 miles long, almost all at a usually higher land mass. This trail is informally referred to as “the donut” as your path is basically a circle. Riding this trail, your hilltop perch will give your unobstructed views of the pacific coast (even 50 miles north to 50 miles south). Griffith Park - One of Los Angeles’s largest parks has a number of short bike paths (2-3 miles each) that offer a much more casual bike riding experience that’s great for families. The park has lots of other family activities, such as a merry go round, museums, and trains.“ It’s like Central Park in NYC,” Riddle says, “but only much, much larger.” Located right near Hollywood, Griffith Park is also easily accessible from pretty much any part of Los Angeles. 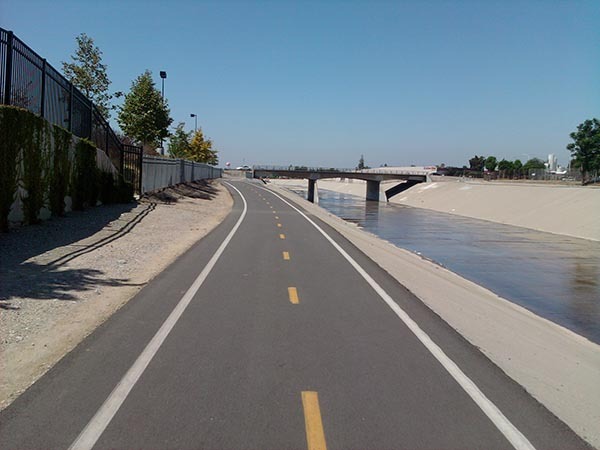 “River Bike Path Network”: Los Angeles’s 3 main rivers that run north-to-south from the San Gabriel Mountains to the Pacific Ocean have generally unobstructed bike paths along them. The Los Angeles river, The Rio Hondo, and the San Gabriel River are part of this river triad. While emphasizing the benefits of the paths along these rivers, Riddle notes that they’ve been de-beautified a bit and have become flood control channels. However, the 100 mile loop without any drivers around offers an unobstructed bicycling experience - which is growing increasingly rare in Los Angeles. Take your bike on the LA Metro for an easier commute. 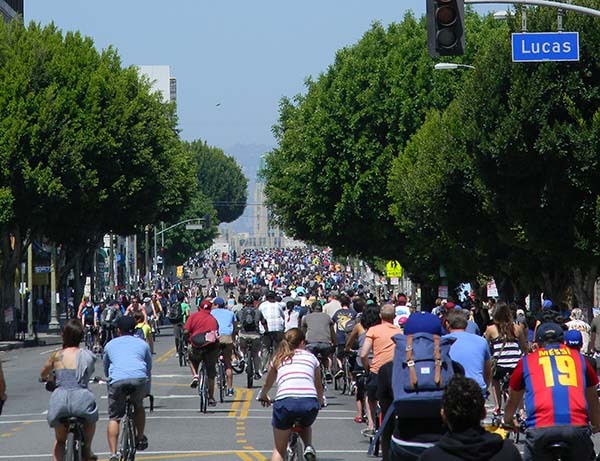 For safety concerns, Riddle recommends that cyclists in LA find the routes that other commuters use and follow along them; traveling in groups increases visibility on roads crowded with cars, helping with safety concerns. “There is safety in numbers.” Riddle said. There’s additional safety in knowing where you’re going. Riddle recommends doing “recon on the weekends” down your route to establish familiarity and experience with it - “the more familiarity you have with the route, the better it’ll be” he says. What makes L.A. different from most major cities where lots of people use their bikes, according to Riddle, is its sheer scale. Riddle notes the city stretches “40 miles east-to-west, north-to-south”, and unlike other major cities, it’s very flat and spread out. This requires most people to use their cars to get around, meaning the streets are filled with cars and cyclists share the streets. “As a cyclist, you will be interacting with automobiles which requires a certain mindset.” Riddle remarked. 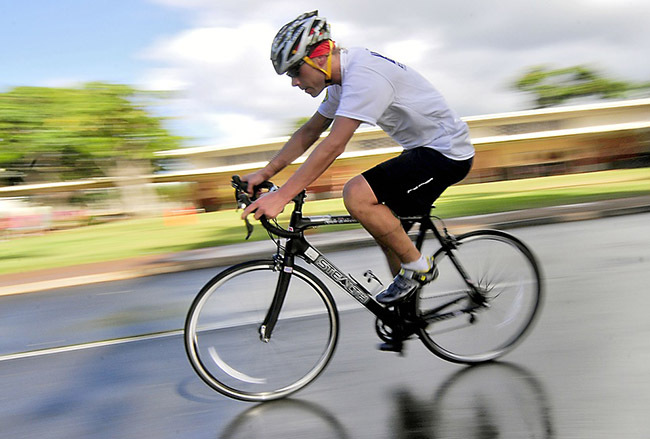 Cyclists should be prepared when to ride and when not to ride - keeping in mind the issues of scale and centricity. 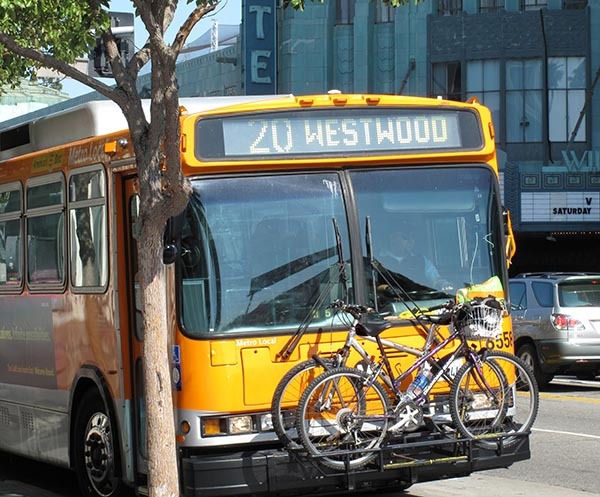 There are real advantages to pairing your bike ride with a trip on LA’s Light Rail and/or Metro; the “multi-modal” transportation, as Riddle refers to it, opens up a lot of the city to those on two wheels. Riddle’s favorite aspect of riding in L.A. might be its “Open Streets” events, where on some weekends major streets will be closed to motor vehicles. This opens up many L.A. roads to foot or non-motor vehicle traffic. 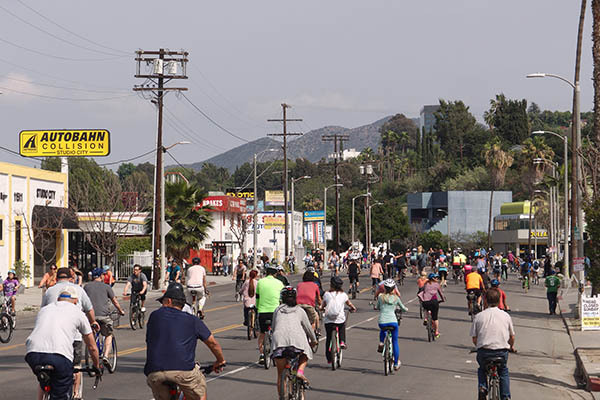 Non-profit CicLAvia which models events after Bogota’s ciclovía tradition (chronicled here in The Guardian) plans “4 big events a year and many smaller scale ones,” according to Riddle. Over the course of the 6-7 hour long events, having 100,000 people or more on the 6-7 mile stretch of blocked off roads is not unordinary, Riddle claims. In noting that he thinks Los Angeles is a good place to bike, Riddle does acknowledge that there are challenges in terms of safety. Still, Los Angeles has year round bicycling, due to its warm weather. “People don’t put away their bikes for the winter.” You can pick whatever you wanna do in L.A., and when you do it, you’re bound to meet some of the many others who do the same sort of stuff, so you can make it a social experience. Riddle has joined up from time to time with SoCal cyclocross, which he calls “a serious group of fun people.” who compete on bike, though some of their events are competitive in nature. Less serious bicyclists can still partake in community with the previously mentioned LACBC, and other riding groups scattered throughout the city. Riddle’s lessons could probably be surmised aptly: biking can be done in L.A. in some truly glorious ways, despite the safety concerns and presumed bike unfriendliness. It just takes a little bit of know how. Cycling enthusiast Jon Riddle has lived in California his whole life and has been a native of Los Angeles for over 20 years. He is the Co-Author of Where to Bike Los Angeles: Best Biking in City and Suburbs, available at a Los Angeles bike shop near you, or on Amazon (from the authors). Oz Moving & Storage - Follow us on Social Media! Oz Moving’s express lines will get your belongings to L.A. fast and safe. Oz handles your move beginning & end with the same care as a local move at an affordable rate. For more information on moving to LA or any other California area, read more on our express line from New York or get a quote for your move.